Every year, starting sometime in early fall, Chili trash talking starts at the Florida Department of Revenue. 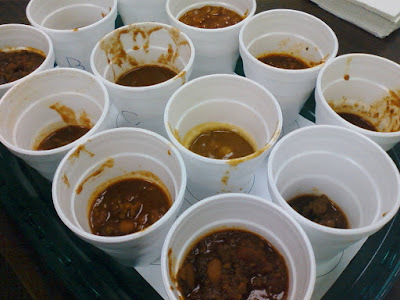 It gets to the point where you have to account for a good 10 minutes of chili-baiting before a meeting starts, where to inquire about prior year results is as likely as not to lead to a tirade against crooked judges and unjust outcomes. I've been doing Grubbus a while, reviewing food from a step back and with a little anonymity. This year, I was asked to be a judge in the contest, to judge on the spot, in full view. The experience was awesome. All four judges were ushered into a conference room and presented with trays with all 13 entrants placed in a unique order for each judge. We were given water, palate-cleansing saltines, and a score sheet. 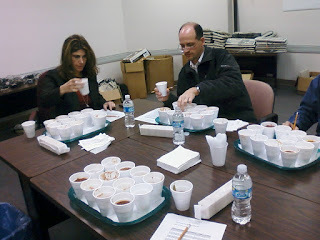 For each chili, we were asked to rate aroma, texture, and taste on a scale of 1 to 5. The final score was aroma + texture + (3 x taste). The entrants were all good solid Florida Chili, which is to say not Texas chili, and while I was prepared to award an extra few points to any beanless entry, none presented itself. We had African-fusion, Indian-fusion, and a green-chili entrant that seemed loosely based on New Mexico Green Chili stew. Nothing too spicy (again, a lost opportunity for extra points in my book), but plenty of spice; and though all but two followed the same meat/tomato/bean/onion formula, plenty of variety. Some were harder to eat than others, but in the moment, as much joking and playing and costumes were in place leading up to the contest, it was very serious, and very quiet. In the end, there was a pretty clear top 3. But the one that mattered was third place. After years of pouring heart and soul into chili, after years of showing up in costume, after years of coming just this close to some chili-recognition, Susan took home a medal with her mild and subtlety spiced Nun Better Chili.